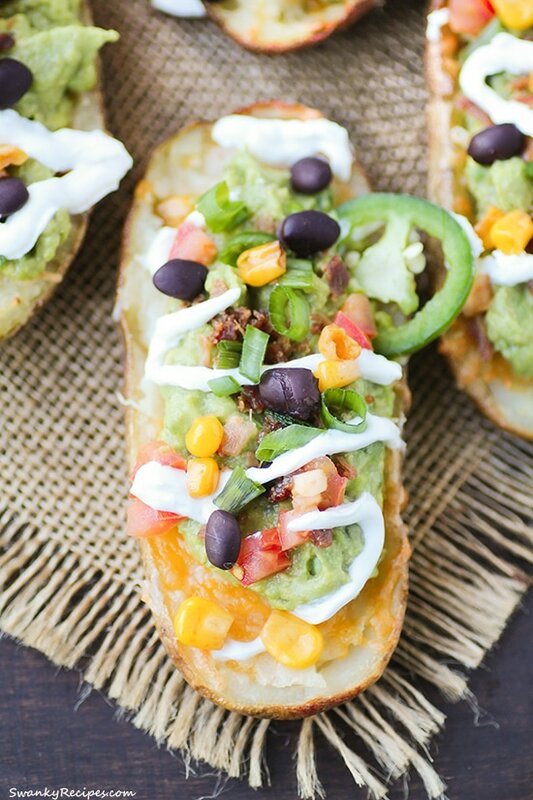 Southwestern inspired loaded baked potato skins with a crispy cheesy skin then loaded with fresh cumin guacamole, tomatoes, black beans, corn, onions, bacon and jalapenos. 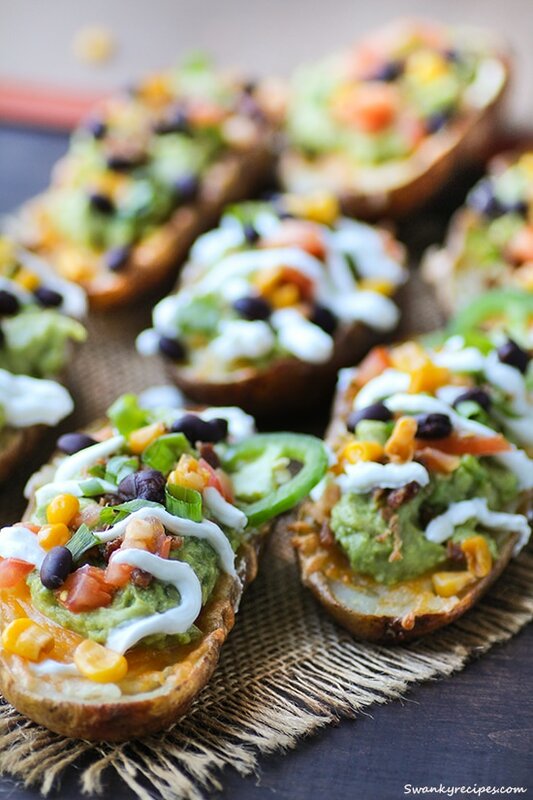 Serve this gluten free recipe as an appetizer or on game day. Make it vegetarian but omitting the bacon. We’ve made it to January which means two things. A lot of people are on a diet, thanks to the New Years resolution and the Super Bowl is coming up. January can be a tough month. It’s still cold outside (and will continue to get colder) while we’re stuck inside shielded away from the cold wind and piles of snow. This can lead us to looking for warm comfort food to warm up to (guilty!). While football is leading up to the big day, we’re searching for healthier food without sacrificing the taste. Behold this vegetable packed potato skin loaded with all the important and most delicious of vegetables. I think I got just about every vegetable I love into that peel plus cheese because I can’t live without it! 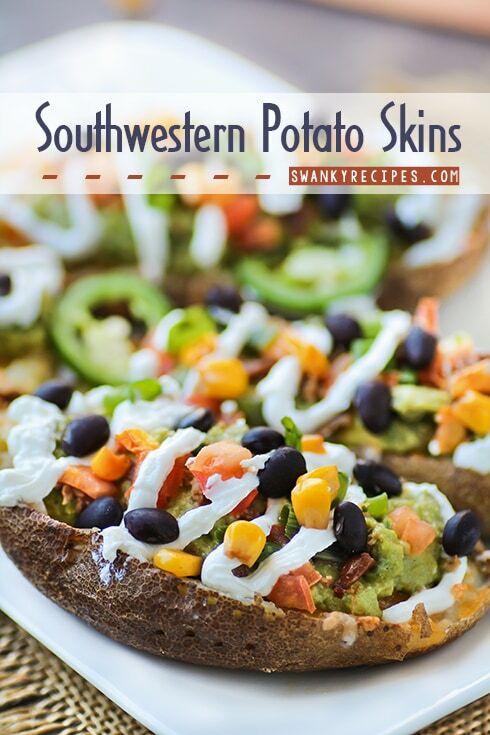 I love to serve these potato skins as appetizers or sides. 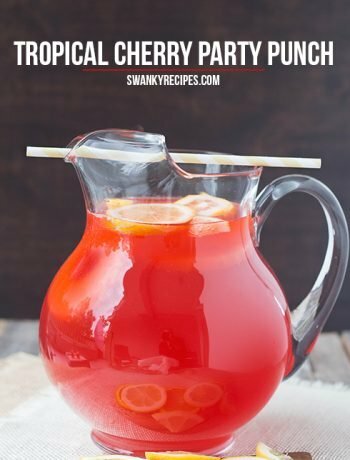 They are great as finger food, make a nice presentation and pack a lot of flavor into each bite. These potatoes start off in the oven and steam for 50 minutes until soft inside. Then they cool off before the insides are gutted. Once the potatoes are cleaned they are brushed with melted butter, a pinch of salt and topped with cheese then placed under the broiler to crisp up. 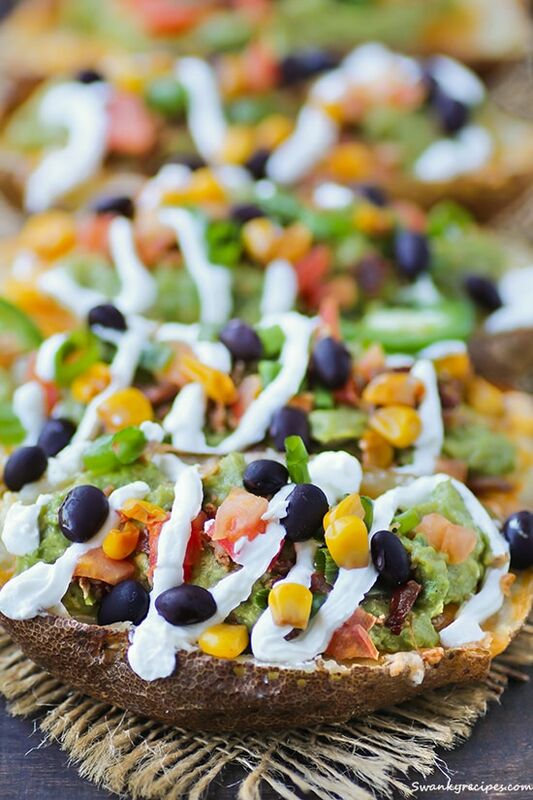 Each potato skin is topped with fresh cumin guacamole, crispy chopped bacon, diced tomatoes, green onions, red onions, black beans, corn and sour cream. Preheat oven to 425 degrees F and line a baking sheet with foil and cooking spray. Wash potatoes then dry them and prick with a fork all over each potato to allow heat to escape. 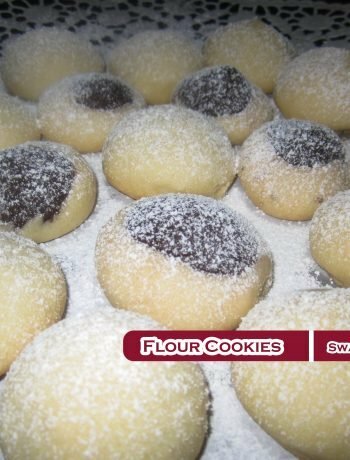 Place on baking sheet and bake for 50 minutes, turning them once or twice. Allow potatoes to cool for about 50 minutes. Fry bacon in pan then chop once cool; set aside. Dice green onion, red onion, tomatoes and jalapeno; set aside. Drain and rise black beans; set aside. Boil corn then fry in some butter if desired; set aside. Cut avocados in half then remove peel and pit. 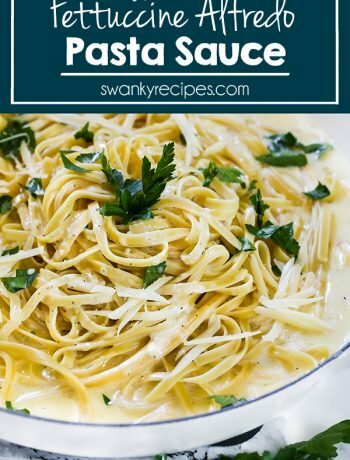 Place into a medium bowl and mash with fork or masher. Combine with lemon juice and cumin and mix well; set aside. Preheat broiler to high. Once potatoes have cooled, sliced each one in half/horizontally. Scoop out potatoes, leaving 1/4 shell and potato inside. Place skin side up on foil lined baking sheet. Brush with melted butter and a little salt then broil 3-4 minutes or until a light golden brown. Remove and sprinkle with shredded cheese then return to oven for 1-2 minutes. Remove potatoes from oven and allow to cool slightly. Fill each potato with avocado mixture then topped with crumbled bacon, green onions, red onions, corn, black beans, tomatoes and jalapenos. Top with drizzled sour cream and serve warm. Oh, this could be a meal in itself for me! Looks delish! I can’t remember the last time I had potato skins! I LOVE southwestern flavors. This would go down a treat in my house. Packed with veggies…could eat a ton of those beauties! Oh yes I could go for those! Love Mexican food plus it’s a healthier alternative to nachos.